The vast majority of Hawaii's state-regulated dams are considered to have "high hazard potential," according to a 2017 infrastructure report by the American Society of Civil Engineers. One of the 124 dams given that classification is one in Honolulu that prompted an evacuation warning Thursday amid heavy rains. Later in the day, officials said the century-old reservoir wasn't in immediate danger of collapsing. Hawaii has 132 state-regulated dams. The hazard potential isn't an indication of the condition of a dam, but the consequences if it failed would be deaths or significant property damage, said Mark Ogden, a member of the report committee and a technical specialist with the Association of State Dam Safety Officials. "Our dams are aging and deteriorating, while downstream populations are increasing," the association said in a Hawaii dam safety performance report . "Thousands of U.S. dams have the potential to fail with tragic consequences." The last time there was a fatal dam failure in Hawaii was in 2006, when seven people were killed after the Ka Loko dam on the island of Kauai collapsed and hundreds of gallons of water rushed downhill. Ogden said as far as he knows that's the last fatal dam failure in the United States. 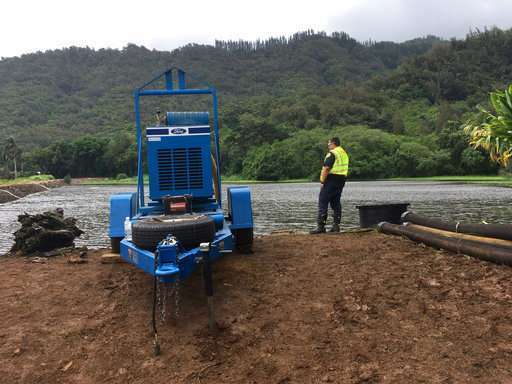 Hawaii's Legislature expanded the state's dam safety program after the Ka Loko breach, said Edwin Matusda, who heads Hawaii's flood control and dam safety program. The infrastructure report noted that 98 percent of Hawaii's state-regulated dams have an emergency action plan. 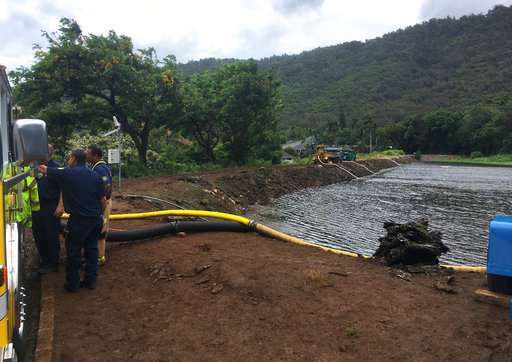 Workers plan to keep pumping water throughout the weekend and into next week as needed from the dam in Nuuanu, a residential neighborhood near downtown Honolulu, said Kathleen Elliot-Pahinui, a spokeswoman for the Honolulu Board of Water Supply. The dam was built in 1905. Water levels in the dam rose 4 to 5 feet (nearly 1.5 meters) overnight as heavy rains from a storm dumped 7.3 inches (18 centimeters) of rain in the area Wednesday into Thursday. The water was 5 feet (1.52 meters) below the top of the dam at midday Thursday. It was also 18 inches (45 centimeters) below a spillway. Areas downstream would flood if water goes over the spillway, said Ernie Lau, the agency's chief engineer. The water was 6.5 feet (1.98 meters) below the top Friday, Elliot-Pahinui said. "We always siphon to keep the water levels low ... well before any storm hits," she said in an email. There was intermittent rain in the area Friday morning. Meteorologists said there will be passing showers in the coming days, but heavy rains aren't likely. There's not much that can be done to reduce the number of high-hazard dams— other than removing them, Matsuda said. The rise of development downstream of dams is especially true in Honolulu, where people live on a small island. Climate change is also a concern. "We are noticing that the hydrology in the islands is starting to change due to climate change, and so it's becoming more frequent that you have these ... rainfall events," Matusda said. Some dams are being retrofitted to increase the spillway, he said. Matsuda noted that while dams may have high hazards, they are also valuable resources for the islands including for hydropower and recharging aquifers. The Nuuanu dam was built for hydroelectricity, but it isn't currently being used for anything, Elliot-Pahinui said. Officials hope to repurpose it as a part of a hydroelectric project, she said.